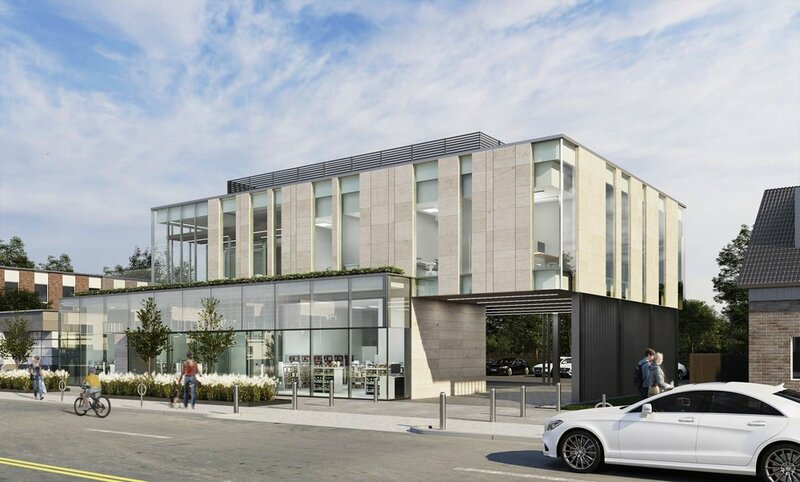 C& Partners Architects, in collaboration with Mehdi Marzyari Architects, have designed a two-storey, 7000 SF medical building on Sheppard Avenue East in North York, Toronto. Providing a host of services, this new medical building aims to contribute, with a positive impact, to the well-being of communities and individuals. The building mass is split into two programmatic boxes: retail and clinical. The ground floor offers retail opportunities and the upper floor accommodates a dermatology and laser clinic, and medical offices. The architecture expresses the program. The upper mass is shifted to the south and to the west. The south-shift creates a one-storey retail podium along the main street, allowing the building to appropriately fit within the neighbouring residential bungalow context. 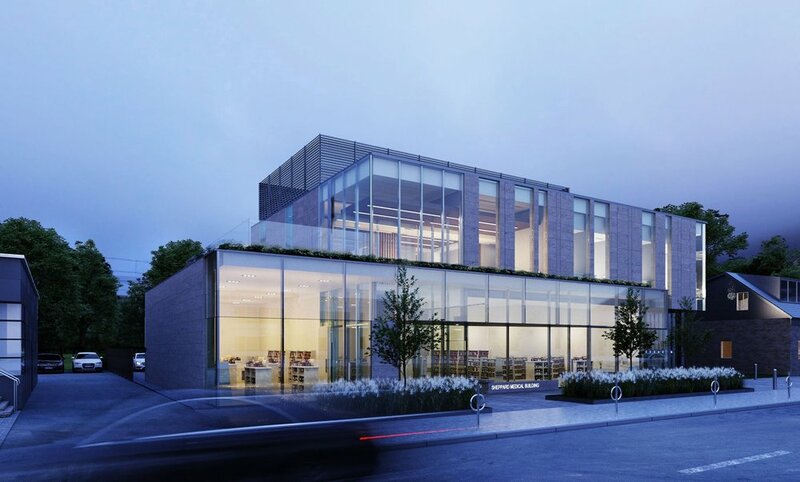 The west-shift frames the entrance to the rear parking and integrates the driveway into the building while creating an outdoor terrace for the Level 2 where the clinic resides. And, moreover, the terrace offers the implementation of a “green roof” that wraps around the building. The building frontage—which includes planters, bike racks and seating—promotes an enhanced streetscape and public realm, further integrating the building into the overall urban fabric. The super-scaled glazed walls extend the streetscape frontage into the retail units and lobby which promotes activity and connectivity. The recessed and angled entrance with a canopy above invites pedestrians into the building. The building is carefully accented with certain elements and materials, extending the exterior environment into to the interior spaces. Exterior limestone cladding continues to the interior walls of the lobby, and dark paving tiles cover the path and carry the visitors forward into the building. The varied spacing of the façade tile cladding is also continued through to the medical clinic reception and waiting area, giving a unified language to the overall building design. With the double height lobby space—visibility from the ground floor entrance lobby—the second level continues the design elements, unifying the two floors in a cohesive architectural language. With primarily limestone cladding and windows expressed in vertical manner, the upper mass provides necessary privacy aligned with the clinical program. A heated driveway system is used under the parking lot to reduce the need to clear snow, and reduce maintenance and allow patients with mobility issues to walk safely to the building in cold weather conditions.